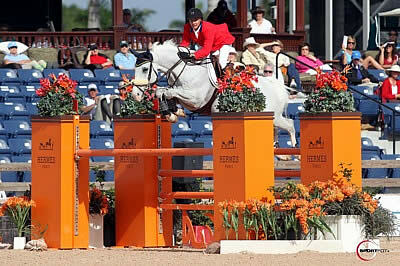 Wellington, FL – March 27, 2011 – Week eleven of the 2011 FTI Winter Equestrian Festival concluded on Sunday afternoon with a victory for Mario Deslauriers (USA) and Cella in the $30,000 Suncast 1.50m Championship Jumper Series Classic Finale. Deslauriers and Cella, owned by Jane F. Clark, was the only pair to master the course with double clear rounds for the win. Guilherme Jorge of Brazil designed the courses in the International Arena this week and concluded the weekend with a challenging course for the 1.50m. Just three of the original 50 competitors were able to go clear in the first round to return for a jump-off. Daniel Bluman (COL) was the first to return for the short course aboard his own Sancha La Silla. The pair had one rail down to earn four faults in 34.158 seconds, finishing in second place. Deslauriers returned next with Cella and put down a fast, clear round in 35.853 seconds to take over the lead. Ashlee Bond (USA) rode Chivas Z, owned by Little Valley Farm, through the course next, but retired from her round after a refusal to automatically finish in third place. 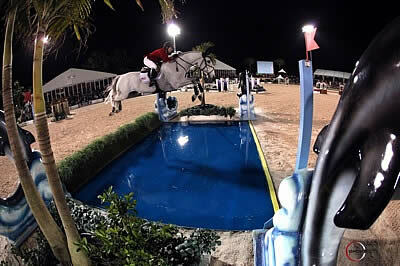 Wellington, FL – March 4, 2011 – The 2011 FTI Winter Equestrian Festival hosted its 10th annual $75,000 FEI Nations Cup on Friday evening, presented by G&C Farm, with an exciting victory for Team USA. Made up of Mario Deslauriers riding Urico, owned by Jane F. Clark, Margie Engle riding Indigo, owned by Griese, Garber, Hidden Creek and Gladewinds, Beezie Madden riding Coral Reef Via Volo, owned by Coral Reef Ranch, and McLain Ward riding Sapphire, owned by Ward and Bluechip Bloodstock, and led by Chef d’Equipe George Morris, the United States came out on top in the unique team competition. After round one competition, the United States was in the lead with just four faults for their total. McLain Ward and Sapphire and Margie Engle and Indigo each delivered clear rounds. 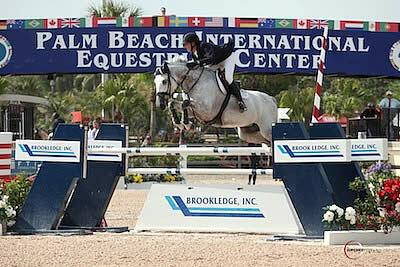 Mario Deslauriers and Urico and Beezie Madden and Coral Reef Via Volo each had four faults. Deslauriers’ score was dropped to leave the team with a four fault total. Coming back for the second round, Ward and Sapphire jumped clear again to keep their team at the top. Engle had an unfortunate rail at the last fence with Indigo, but Madden and Via Volo pulled it out in the end to also jump clear and leave the team with just eight faults in total. Mario Deslauriers and Urico won the first qualifier to help put the USA in pole position in the Jumping Championship at the WEG today. Photo: FEI/Kit Houghton. Lexington, 4 October – The host nation took a firm grip on both the team and individual leaderboards as the Jumping Championship got underway at the Alltech FEI World Equestrian Games in Kentucky, USA today. Mario Deslauriers steered the powerful gelding Urico into pole position in the exciting Speed event, which is both the first individual qualifier and the class that decides the rankings for tomorrow’s team competition. And he had the best back-up around in the shape of fellow-American McLain Ward who steered the great mare Sapphire home just a little slower to slot into runner-up spot. As expected, the US riders, who are strongly tipped for medals this week, came out with all guns blazing. But there were plenty of surprises throughout the day and the biggest of these was the spectacular performance of Hungary’s Sandor Szasz who slotted into third place. Riding Moosbachhofs Goldwing the relatively unknown 39 year old stormed into the lead with a clear round in 71.79 seconds as the first half of the competition was coming to a close. But, with just four left to run before the lunch-break, Deslauriers and Urico raced through the timers in 71.25 seconds to re-set the target. Lexington, Ky., Oct. 4, 2010 — U.S. riders Mario Deslauriers, on Urico, and McLain Ward, on Sapphire, set the pace in the first leg of the team competition at the Jumping World Championships, presented by Rolex. Their performance led the U.S. team to the top of the team rankings, with two more days of team jumping to go at the Alltech FEI World Equestrian Games. Deslauriers and Urico stopped the clock after a clear round in 71.25 seconds. Ward and Sapphire, riding almost five hours later in the field of 121 horses, fell just short, in 71.79 seconds. Sandor Szasz of Hungary, who is competing in his first international championship and has never placed in a major international competition before, surprised his competitors and the roaring crowd in the Rolex Arena by urging Moosbachhofs Goldwing through the finish in 73.24 seconds.